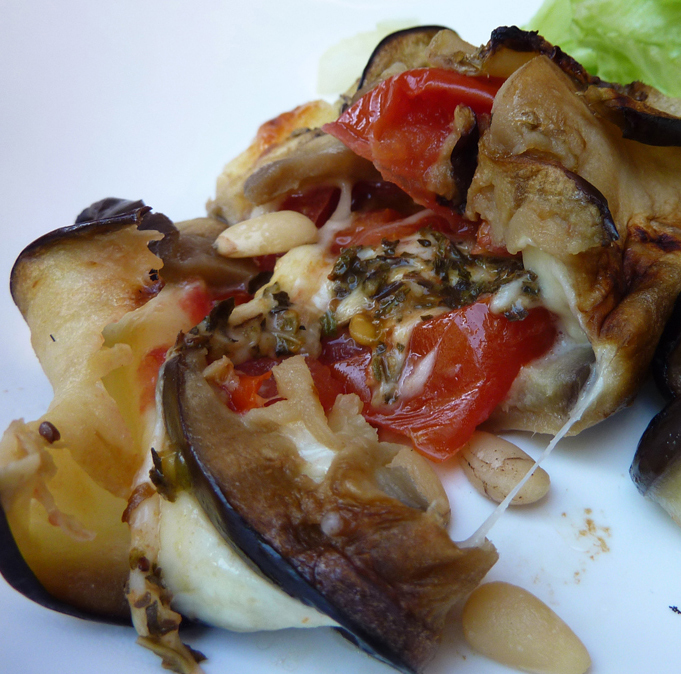 This is one of my favourite aubergine recipes for it’s simplicity of taste and making. We enjoy it as a light lunch with salad or a more hearty dinner with vegetables. Cutting the aubergine strips thinly will ensure you get 8 slices out of one aubergine and makes it easier to fold the strips over. There’s a fine line though – too thin a slice will break up when you fold it so have some cocktail sticks to hand to pin the parcel together. which recommends boiling the aubergine slices in salt water for 2 minutes and then grilling the finished parcels for 5 minutes on both sides. If I didn’t skip the ‘chill for 30 minutes‘ step then I might well find that the parcels hold together better: as it is I always need to cook them straight away and have never dared try flipping them over as the cocktail sticks are holding the top closed. So instead I tend to lightly brown the slices before assembling the parcels as below (although the pictures show the boiled, then grilled version). I didn’t have fresh basil leaves so used dried herbs and the pine nuts were shaken directly from the packet having forgotten to toast them. Well when you’ve spent a morning digging and want lunch from fridge to table in 30 minutes you don’t worry about the small details do you! Remove the stalk from the aubergine and cut it lengthwise into 8 slices, disregarding the two outer edges. 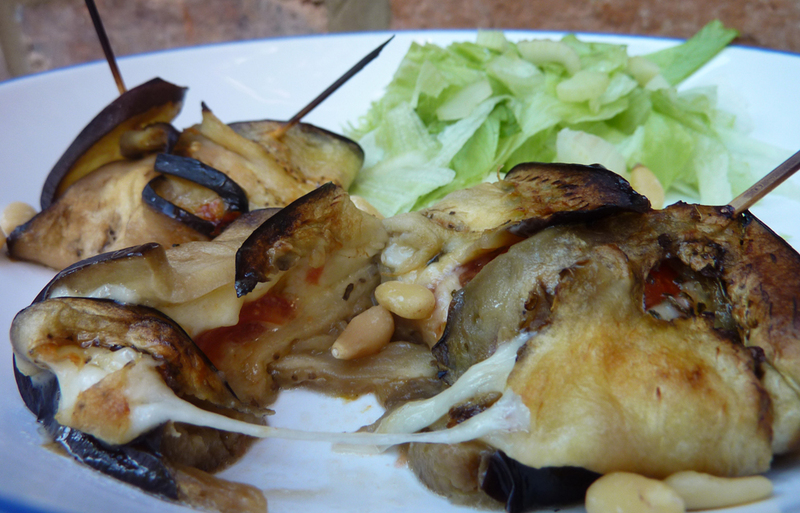 Brush the aubergine slices with oil and lightly brown under the grill or in a frying pan. 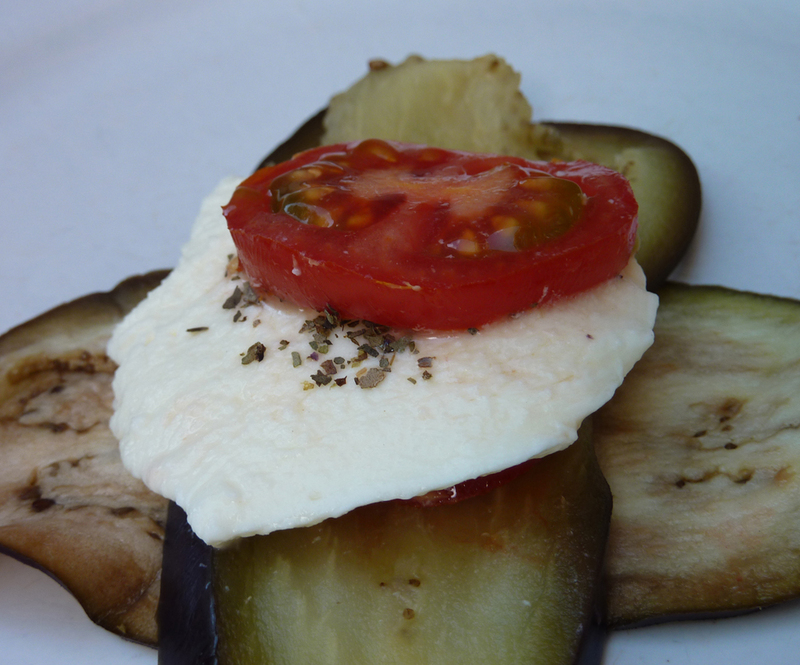 Cut the mozzarella into 4 slices and the tomato into 8 slices, disregarding the outer edges. Place 2 of the aubergine slices in a flameproof dish, forming a cross. Place a slice of tomato on top, season with salt and pepper, add a basil leaf, a slice of mozzarella, another basil leaf, then more salt and pepper, and finally another slice of tomato. Fold the edges of the aubergine around the filling. Repeat with the other ingredients to make 4 parcels in total. Cover and chill for 20 minutes or until required. When ready to serve place the dish under a pre-heated grill and cook for about 5 minutes or until golden brown. Serve hot drizzled with a tomato dressing and scattered with the pine nuts and extra basil leaves. To make the tomato dressing whisk together 2 tbps olive oil, 1 tsp balsamic vinegar, 1 tsp sun dried tomato paste and 1 tsp lemon juice. Yum, wheres the crusty bread to mop up some of those lovely juices. Now that’s my kind of snack ! Lovely Nic and pretty pics too. I could just eat that for my breakfast, love aubergine. Haven’t you had any of the horrible weather then, or did you did in the rain regardless? I’ve just had dinner but that looks delicious. I’ve made something similar to that before, but without the pine nuts and served it as an appetizer. The aubergines we get here are long and very skinny so when I made it I cut long strips and rolled them up, securing them with a toothpick. Ann – mmm, aubergines for brekkie, I could eat that too. Well I have done some digging in the rain this week but on the whole it’s not been too bad. Positively gorgeous mild autumn weather some days. Another super veggie dish, and who doesn’t love pinenuts! absolutely but I always forget to use them and sprinkle without them seeing the inside of the pan!